I’ve checked in to my flight, my luggage is almost packed and, in the morning, I’ll be headed to Heathrow Airport. After that? Denver, Colorado. A quick check of my phone and I’ve been messaged by some friends over in the Centennial State: “Can you bring some Cloudwater?” And so, off to my local bottle shop I plod, in search of shiny cans decked in pastel tones. Although this desire from American consumers to experience the cutting edge of modern British beer is a relatively recent phenomenon, it feels significant—as though the UK industry has begun to earn the mutual respect of its neighbors across the pond. According to Jones, he’ll spend on average 2-3 months in the U.S. per year for research and development purposes—attending conferences, festivals, and brewing collaborations. In addition to this, he’ll spend a couple months on the road visiting Europe and other UK cities away from his business’ home in Manchester. By building a bigger picture of the global industry at large, he’s able to nurture a far more focused vision for his own brewery in turn. But it’s something he personally sees as benefitting the UK industry as a whole, and not just Cloudwater. The British beer industry has experienced a boom in its modern era that's not unlike what's been happening in the U.S. The United Kingdom now recognizes more than 2,000 breweries, the second highest amount in the world after the United States, and reportedly the highest per capita. But this industry is still dwarfed by that of its American counterpart, which is home to bordering on 7,000 breweries and still rising. Many within this new wave of British breweries were directly inspired by the progression and evolution witnessed within the U.S. beer industry. Whether it’s the culture fostered at taprooms, business savvy ideas such as own-premise retail, or technical achievements (from dry hopping ratios to biotransformation), British brewers have loads of it. And it's a point that runs adjacent to the story told by many U.S. breweries founded in the 1980s and '90s, who took their inspiration from classic British ales. There's a cyclical, almost-symbiotic relationship between these neighboring industries. Observing how the American beer industry goes about its business—and how, in turn, consumers respond to it—continues to be critical for British breweries. Events such as invitational festivals organized by the likes of Firestone Walker and distributors such as Shelton Brothers have proved to be ideal observation points. In turn, it’s at these events that traveling Brits form close bonds with their U.S. peers. This spurs future collaborations, and visits returned in kind at events such as The London Craft Beer Festival and at Beavertown’s Extravaganza. But how does heading over to the U.S. to pour a few beers and make new friends translate into tangible experiences that can benefit your business back home? A small brewery trying to make serious inroads into U.S. distribution would find it both costly and challenging. The real value in a small British brewer sending beer to the States is having the excuse to go out there and pour it, absorbing as much of the culture and knowledge from the largest brewing industry in the world. Another British brewer that has applied insight from the U.S. market to its practice is Yorkshire’s Magic Rock. American influence was in plain sight from its launch in 2011, with a core range featuring beers such as High Wire Pale Ale and Cannonball IPA, directly inspired by the Californian West Coast. Founder Richard Burhouse has continued to visit the U.S. as his brewery has evolved and expanded, with events like Shelton’s Festival and Cigar City’s Hunahpu’s Day continuing to fuel that inspiration. The result of British brewers taking the time to acquire knowledge from their U.S. counterparts is that the modern British beer is no longer just a little window dressing in the frame of the much larger U.S. industry. Putting my earlier anecdote about picking up a few Cloudwater cans for Coloradoan friends to one side, we’re seeing greater amounts of British brewers listed at U.S. festivals and an increasing amount at large-scale industry events like the Craft Brewers Conference. Plucky young UK breweries are also picking up accolades at the Brewers Association's World Beer Cup, even in categories with fierce domestic competition like IPA. Thanks to the gradual construction of transatlantic relationships, the U.S. industry is perhaps more engaged in British beer than it has ever been. The days of a token line dedicated to the likes of, say, Old Speckled Hen or Sam Smith’s Oatmeal Stout as the sum total representation of British beer culture in the U.S. may be slowly fading. And it's instead replaced with a curious interest in what has become an exciting beer market. For Greg Engert, owner of celebrated DC beer bar Churchkey, showcasing a range of British beers has often been a way of generating a little extra excitement amongst his customers. However, despite this growing interest in the UK’s new wave of brewers, there is evidently still plenty of love for the classics. The appeal of classic British styles is still something Engert says his customers are drawn to. Add this to the fact that many of the hoppier offerings sent over the pond simply won’t hold up to the fresher offerings from their U.S. counterparts, and you can start to build a picture of how difficult it might be for a modern British brewer to gain a foothold within the American market. 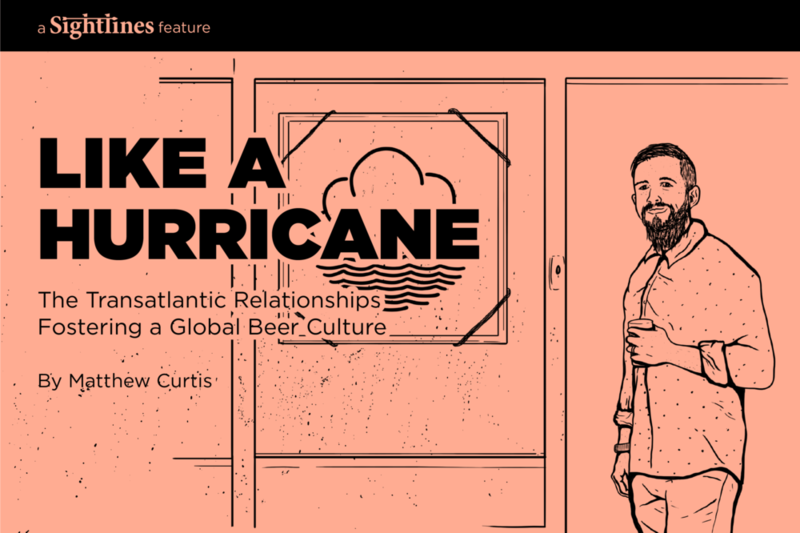 Bars like Churchkey framing British beer in a more classic light doesn’t put a dent in the efforts made by breweries like Cloudwater to showcase the more vibrant side of modern British brewing. Perhaps finding the subtle nuances between modern styles fashioned by British and American brewers alike will be the next great challenge for UK breweries eyeing the U.S. market. For modern British brewers making curious forays into the U.S. market, there’s also the challenge of balancing this desire to explore with staying connected to your local trade. Like in the U.S., British beer consumers are fiercely fickle. In a market of more than 2,000 breweries with an intensely compact infrastructure, it doesn’t take much before consumers are drawn toward the next big thing. However, channeling all of the energy and experience gleaned from research trips across the pond could actually be the key toward sustaining that interest—as well as improving existing attitudes within the UK beer market.